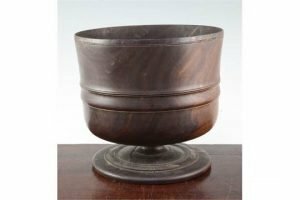 A late 17th century lignum vitae wassail cup, ring turned on circular spreading foot. 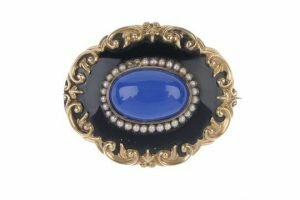 A mid Victorian enamel and gem-set memorial brooch, the replacement oval blue chalcedony cabochon, within a split pearl surround, to the black enamel and scrolling foliate border. 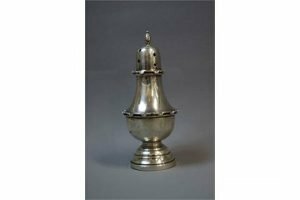 A hallmarked-silver sugar castor, Birmingham assay 1927. Total weight approximately 96g. 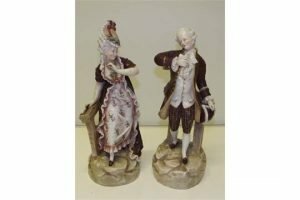 A pair of German Rudolstadt figures, modelled as a lady and gentleman, she holding fan, he holding his tricorn hat, impressed marks for Ernst Bohne Söhne, blue anchor stamp. 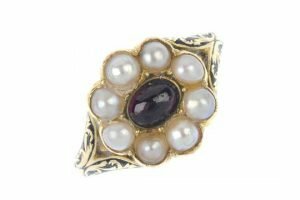 An early 19th century 18ct gold memorial ring, designed as a central oval-shape cabochon garnet, with eight cultured pearls to the surround, to the black enamel and scrolling shoulders with personalised inscription to the reverse. Hallmark for London, 1834. 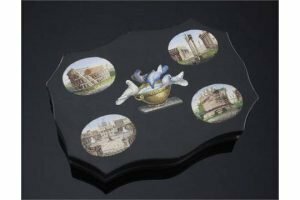 A 19th century Italian black slate and micro mosaic paperweight, of serpentine form, decorated with Pliny’s doves to the centre and four other micro mosaic oval panels depicting ancient Rome sites. 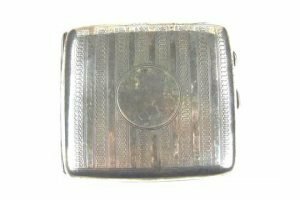 An Edwardian silver cigarette case of rectangular form, decorated with linear engine turned patterns, mark of Joseph Gloster, Birmingham 1908. 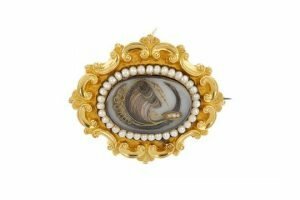 A mid Victorian gold split pearl memorial brooch, the oval arranged hair panel, within a split pearl border and scrolling surround, to the reverse inscribed ‘Captain Henderson of Stemster died Oct 31st 1859’. 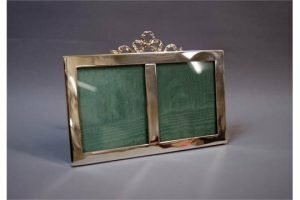 A hallmarked-silver double picture frame with bow surmount, London assay 1912. 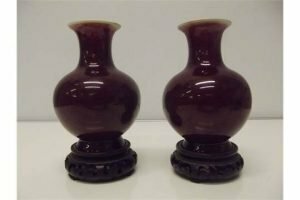 A pair of 19th century Chinese monochrome sang de boeuf vases, baluster form with flared rim on carved wood bases. 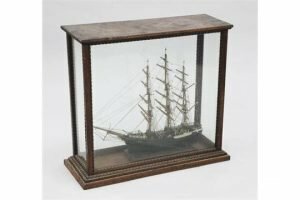 A scratch built model of a three mast clipper, in an oak glazed display case, with rope twist mouldings. 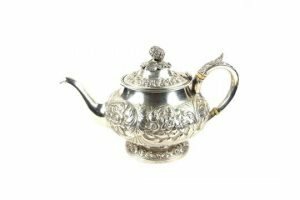 A Victorian silver teapot of bulbous circular form, with an acanthus scroll handle and circular foot, both the body and hinged cover ornately decorated with a variety of floral and foliate patterns in repousse. 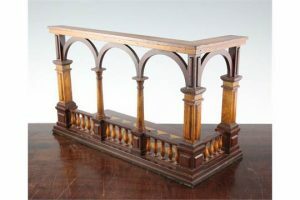 A treen architectural book stand, modelled as an arched balustrade, with tapering columns. 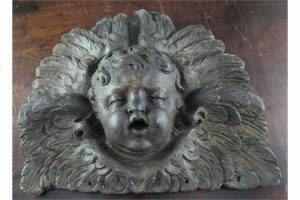 A continental 18th century oak carved winged cherub wall appliqué. 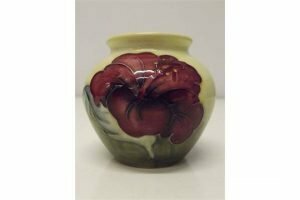 A Moorcroft pottery vase of bulbous form with flared rim, tube lined in the Hibiscus pattern against a fading green ground, impressed marks. 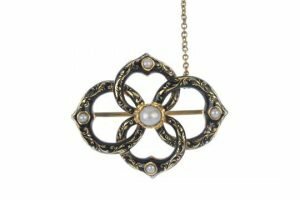 A mid Victorian 18ct gold, enamel and split pearl memorial brooch, comprising a split pearl, to the split pearl accent scrolling foliate and black enamel, interwoven loop surround. 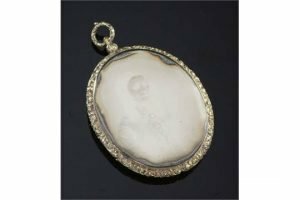 An oval Victorian daguerreotype mourning pendant, with chased gilt metal frame depicting a portrait of a lady, with floral hairwork picture to verso. 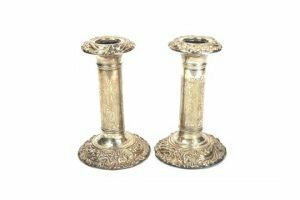 A pair of Edwardian loaded silver candlesticks with cylindrical stems, both the sconces and circular feet with bands of scrolling Rococo repousse decoration. 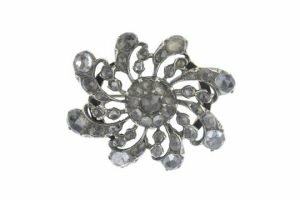 An early 19th century paste silver gilt brooch, the rose-cut paste cluster within a similarly-set spiral surround. 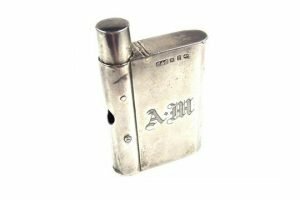 A Victorian silver combined Vesta case and Cigar cutter, of rectangular form with a button and spring action cigar cutting mechanism and a match striker beneath.